Hunting becomes an easy task with the best thermal scope. Initially, thermal scopes were equipment for the selected few including military sharpshooters to see their targets in all lighting situations. Today an avid hunter can get a hold of one of them and find animals during the day and night. This is one of the most exciting things in hunting that never existed before. Night hunting was a normal thing that hunters used to do to pass time since they had limited options to identify game in the wild. Luckily, hunters can now shop for thermal scopes for different hunting situations. There are different thermal scopes that exist in the market and with such a huge variety, finding one that best fits what you need can be hard. We have made the process easier for you by compiling a detailed guide to help you find the best thermal scope for hunting including a list of some of the best thermal scopes around. The ATN Thor Smart Thermal Scope offers great optical power ranging from 1.25x to 5x and a resolution of 384 by 288. This makes it a perfect choice for night vision because it can detect heat energy instead of normal light. It also features a ballistic calculator that gives you the exact target you want so you can get the point of impact to take down your target. This scope boasts of a built-in rangefinder that operates on a smart technology to help you improve your shooting skills and make more hits. An addition excellent feature is the smooth zoom that allows the hunter to magnify and see the target without losing the environment around it. This state-of-the-art thermal scope has the ability to record 1080p High-Resolution Videos and photos along with recoil activated video. After recording, you can comfortably stream the video using its Wi-Fi. The firmware in this scope can be upgraded anytime. The AA battery life shows outstanding performance in this scope. 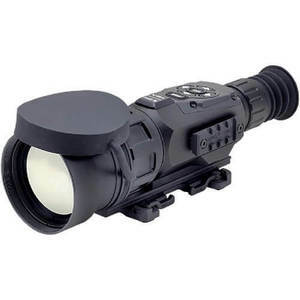 This scope is also lightweight and manageable, which are excellent features for the best budget thermal scope. Question: How much does the riflescope weight? Question: What are the actual dimensions of the scope? If you’re a passionate hunter, you must have come across Zeus 336 rifle scope. It reflects the unending quality and flexibility provided by this brand. 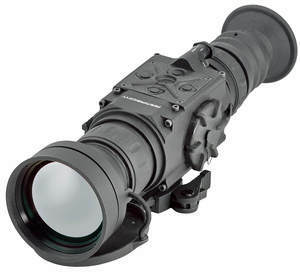 This incredible scope is designed for hunting throughout the day and night. In fact, it is the smallest and lightweight scope with easy-to-use controls that work with intuitive buttons as well as menu options. It allows the hunter to take control to achieve the desired riflescope performance during hunting. Armasight Zeus 336 Thermal Scope features one of the most advanced technology among the Zeus collection. It’s a great tool designed for sport, military, hunting, and law enforcement. The mounting system on this scope comes in handy to allow the hunter to mount or descend the scope easily. You will also enjoy the high-quality zoom with different options from 1-4x. It also offers exceptional optical 3.4x magnification. This Zeus thermal scope amazing flexibility has made it among the favorites hunting rifles for many contemporary users. This product is an excellent choice for professional hunters looking to have a great hunting experience in any lighting condition. Question: What are the exact dimensions of the riflescope? The scope measures 7.6 x 2.7 x 3.1 inches. Question: For how long does the battery run? The scope’s battery can run for up to Up to 4 hours with an option up to 12 hours. Question: Does the scope come with a warranty? Yes, it comes with a 3-year warranty. There is no need to break the bank when you have a quality thermal scope like the Armasight Predator 336. This product comes with some great features at a low price tag. It’s the most technologically advanced family of Predator imaging weapon sights to the military, sporting, and law enforcement markets. The Predator product is light and portable. 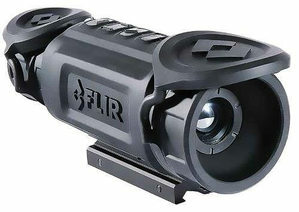 It is a FLIR device which emphasizes the quality and status that Armasight brings into the market. They have intuitive controls and functions that with an impressive menu to choose from. This layering which is easy-to-use and understands provides the hunter with a structure for exploiting a variety of options present this product. This software can be upgraded and allows the user to pick from six reticle patterns, access the digital E-zoom with up to 4x magnification, access the recording feature, and finally adjust the contrast of the image. The remote switch is also included in the Predator for easier activation of the thermal scope when it is in the “standby” mode. The optical video recorder that allows you to record every hunting moments from the start to the end. This scope also comes with a 1.6x optical zoom for resolution free sighted magnification. Overall, this is the best thermal scope for the money that provides a great feature-set and costs under $5000. Question: What are the dimensions of the scope? This scope weighs7.6 x 3.2 x 2.8 inches. Question: What is the riflescope’s refresh rate? The scope has a 30 Hz refresh rate. 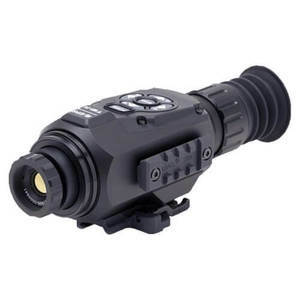 The Pulsar Apex XD38A is an outstanding thermal scope operated with a wireless remote. It offers 1.9x magnification and 50Hz refresh rate. All this comes with a 384 by 288 resolution. It does have an incredible one-shot freeze function to allow the user to capture the images they want to save. It also comes with a unique feature that allows you to look at an image and at the same time capture another within it, just like an image-in-image setting on your television. The resolution on this product is excellent with a precise capability to capture images in the 1,000-yard range. The continuous digital zoom feature is very reliable for distance detection. This picture-in-picture feature allows you to magnify a picture of the reticle’s focus point at the top of the screen. This is a great way to take the best clip on thermal scope for later viewing. Once you have the scope in position, you can set your focus in three different modes (Identification, Forest, Rocks) within no time so you can view your images either manually or automatically. Another cutting-edge feature of this scope is the internal dampening system that maintains the thermal core stability of up to 1,000Gs of recoil. It also comes with other amazing features such as an upgradable software to improve the product performance. Question: What is the weight of the thermal scope? The riflescope weighs about 3.3 pounds. Question: What is the riflescope’s frame rate? The scope has a 50 Hz frame rate. Another state-of-the-art product from Armasight is the Zeus 640 which is also the latest technologically advanced family of Zeus thermal scopes. It’s used for sports, military and law enforcement activities. The Zeus 640 functions as a magnified spotting scope equipped with the latest FLIR VOx microbolometer core. With an advanced thermal imaging technology, it’s easier to detect your targets even through harsh conditions such as dust, snow, fog, smoke, and other atmospheric particles. It is lightweight and compact with intuitive controls, features, and functions that are layered properly to a direct combination of menu selections. This arrangement comes with easy to use and understand controls for the hunter with a variety of setting options to make the hunting experience fun. 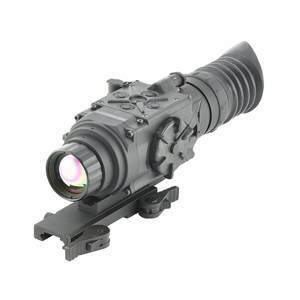 Due to its lightweight design, this scope has become quite popular. The digital zoom that extends from 1x to 8x, with different color modes including black hot, white hot and rainbow allow the hunter to magnify their target in any situation. It also features an impressive six reticle patterns including no reticle, cross-center dot, cross, line dot, crosshair, and dot 4 MOA. With these amazing features, there is no doubt that the Zeus Thermal Imaging Weapon Sight is one of the most advanced and sophisticated sighting devices in the market for hunting and other military activities. Question: What is the actual weight of the scope? This scope weighs8.4 x 2.7 x 3.1 inches. The scope’s battery can run for up to 4 hours. While price is a huge determinant when shopping for a good thermal scope, you can still get good value for your money with these under 5000 thermal scopes. What follows is high-quality night vision rifle scopes including the most advanced scopes that are suitable for nighttime predator hunting. With this product, you can expect superior operation in low light conditions, crisp images and durable devices built to withstand the severities of combat. Let’s dive into the details. If you think you have seen it all among the best thermal scope, you have not checked out the new HD 640 Smart Thermal rifle scope. It is designed to give as much precision as possible at the desired speed that you may need during hunting. With an impressive 640 x 480 high-resolution sensor, this thermal scope is exactly what you need for a clear shot in complete darkness. The ATN ThOR scope comes with an inbuilt technology commonly known as the Smart Shooting Solution that allows the hunter to avoid the hunting hassles with the state-of-the-art reticles, charts, and calculators to get a perfect shot. Once you enter your focus range on your target, the ballistic calculator will adjust your point of impact to help hit the target with the first attempt. The scope’s Recoil Activated Video feature is something to be desired as it allows you to records any video during the entire process so you can record memorable hunting adventures from the word go. Just in case you want to relive the experience, the HD imaging provides a great recording experience and store them in an SD card. Just to make the experience even better, a remote control feature is added to easily operate the calculator, rangefinder, and so much more. The scope measures 10 x 6 x 6 inches. The scope’s battery can run about 8 hours. FLIR RS64 Thermal Night Vision Scope is made with a cutting-edge correcting functionality to fit the needs of the user. It’s packed up with a variety of impressive features. The scope’s multiple reticle options allow you to target with precision. This combination can be adjusted to get a clear shot of moving objects. The RS64 thermal scope is compatible with the Picatinny Rail Weapon Interface that offers a cool three inches of eye relief and a body heat detector to identify heat energy instead of light. With a simple-to-use four-button user interface, you can now bid goodbye to the hassle of pressing the wrong buttons. The matrix LCD screen on this scope requires little background light which means it can be used even in the dimly lit areas or dark areas. Although the RS64 night vision rifle doesn’t come with an external battery pack, it can match one. So, if you have an extra battery, it’s easy to power the scope in case the battery runs down. The battery will provide about four hours of service before the next recharge. Whether you want to hunt during the day or night, FLIR Systems RS64 Thermal Night Vision Scope is the best thermal scope for coyote hunting with high precision and value for money. Question: Is the thermal riflescope impact-resistant? Yes, the FLIR Systems RS64’s body is impact-resistant. Question: What are the colors available for the RS64 Riflescope? The scope in only one color, black. The riflescope weighs about 1.8lb. Thermal scopes are great tools for hunters to take advantage of the mildly light areas and hunt as normal. Whether you’re looking for the best clip for your thermal scope or just a cool rifle scope for the money, it is important to know the available options. Thermal scopes have been around for some years now and they are designed to allow people to get a clear view at night by showing the ambient heat of the target. Here are some key things to look for when shopping for the best thermal imaging scope. The scope’s magnification power varies greatly, but choosing the best magnification power will make your hunting easier. If you intend to use the thermal scope to view objects at long distances, you need to choose a thermal scope that offers good optical and magnification power. Magnification has both merits and demerits. With a low magnification of 4x-6x, you get better and faster target tracking as well as a more accurate shot. On the other hand, higher magnification of 16x and above provides some exceptional target resolution. The only downside of having higher magnification scopes are the high cost, large size, and the complexity of use when placed in an unsupported position. It is strongly recommended that you go for thermal scopes with more than 10x magnification power if you want to take a clear shot without worrying about the position. But you must be prepared to pay more for an exceptional scope. The focus of the objective lens is a key aspect to consider when buying a thermal scope. This is because the focus affects other factors such as the magnification and field of view. The first thing is to check the diameter of the lens and if it’s small, then the field of view will be narrow and may not operate well in low light conditions. On the other hand, if Len’s diameter is large, it will offer a greater field of view with more light which allows the user to see more clearly even in low light conditions. There are those scopes that feature adjustable objective lens to allow for tweaking and great control of the target. This is appropriate when you want to focus on distant objects and still maintain precision and good clarity. Just like the digital display screen, a thermal rifle scope also relies on an advanced technology which uses an image resolution to give a clear view. Low resolution will result in a lower quality image. With high resolution, the image will be clear and crisp and it will be easier to see the edges and get a clear shot especially if the high resolution is combined with a higher refresh rate. Another advantage of a high resolution is that the user is able to zoom in at target objects without compromising the quality and clarity of the image. Image resolution is important in a thermal scope and it’s worth consideration especially when you have to spend a good amount on a thermal scope. So, ensure you shop for a scope with a higher resolution and within your budget. The nature of the reticles is an important feature to consider to help you get a good view of the target. There are some thermal scopes that come with a four-line standard reticle and those with a single-dot reticle for more accuracy. The four-line reticles are divided further into reticle with thick lines and those with fine lines. There are a different variety of reticle options that allow the user to switch between when needed. The most popular reticle patterns you will find are the duplex, BDC, and mil-dot reticle. The duplex version is known for accurate targeting and shooting when hunting. The mil-dot reticle comes with advanced enhancements than those in the duplex to allow the user to identify a target range. Bullet drop compensator (BDC) is the latest improvement of the other two with advanced options for a thermal scope. With this option, you will be able to adjust the settings to make an accurate shot over a wide target range. Another aspect to consider with the thermal rifle scope is the refresh rate. Simply, it is the rate at which the thermal scope refreshes the view. The refresh rate of a scope determines the quality of the image. As a rule of the thumb, the more refreshes you make, the more clear the image when you are tracking a target on the move. The ideal thermal scopes come with a refresh rate of 30 Hz or 60 Hz. At this refresh rate, it’s easier to see your target clearly, even when it’s moving. For static viewing of the target object that is moving slowly, a refresh rate of 30 Hz is fine. But if you intend to use the scope to capture a good view of fast-moving objects, a 60 Hz refresh rate will help you get a clearer result. 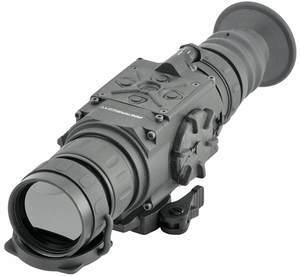 Thermal night vision rifle scope operates on battery power. You need a scope with battery power to last you longer when hunting. The battery options may vary greatly depending on the model of the scope, but extended battery life will guarantee more hours of hunting. A good thermal scope may provide up to 8 hours of battery power before the next recharge. This is enough for a single expedition in dark situations. Most of the thermal scopes also use lithium-ion rechargeable batteries. Some even come with spare batteries or a one-hour charger to boost the battery when needed. Remember you’re in the fields and you need to carry a battery that will take you through for more than five hours before recharging. If you have been planning to go hunting this season, you may need to check if you have a good thermal scope for the task. These scopes are equipped with the most advanced technology including radiation sensors to detect heat at any time. Finding the right one can be a daunting task, but our guide will help you make the right choice based on your style, budget, and preference. Once you get the right thermal scope you are set for more accurate shots even in the most unthinkable places to hunt. In the end, it’s all about what matches your needs. Make the right choice!